In the unfortunate event that your power goes out, you are at the mercy of your power company—unless you have a generator. A generator is a back-up source of energy for your home. Generators use natural gas or propane to create electricity for your home. If your household uses natural gas or propane for heat or any other appliances, you are already set for generator installation. If your electricity goes out, an automatic generator will sense that and start up immediately—even if you are not home. The generator provides electricity for your home until the power company restores it. No spoiled food, no frozen pipes, no waiting in the cold or heat, no darkness. It’s as if nothing ever went wrong. 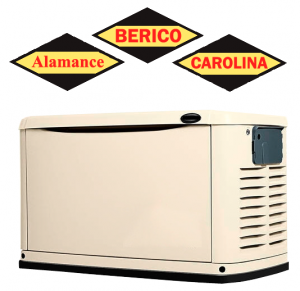 If the idea of a generator sounds good to you, we can install one of our top brand generators in your home. For generator install in Greensboro, we partner with Honeywell and Generac brands to ensure that you will have reliable back-up power for your home. Our experienced technicians can correctly install a generator in your home or small commercial building that will provide back-up power you can count on. There may be times throughout a given year that your generator turns on for an extended period of time due to a power outage. You want to be prepared. Call Berico for your protection and maintenance plan to ensure you are ready for the worst. It is critical that an annual tune-up is conducted on your generator to help prepare for power outages. If for any reason you are not satisfied with a repair, we will return to fix it and will not leave until you are completely satisfied. Additional maintenance or repairs discovered on service visits will be subject to standard rates with a 20% discount.